New LRV running in Denver, CO. as a test train just prior to the opening of their new system. While not nearly as common as the PCC once was, the Siemens Duewag cars are used on several systems. Photo by Dave Cremins. In the cities that chose not a abandon their car lines the trolley and PCCs were, for the most part, replaced by a more modern car, the "LRV", or Light Rail Vehicle, and some were upgraded to rapid transit lines. Today we even see an increased use of the modern day trolley, with old lines reopening and new lines being opened in many cities. 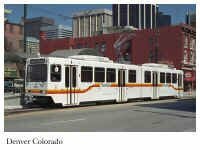 In resent years new LRV lines have opened in Denver, Colorado, In Portland, Oregon there's MAX Light Rail, a part of their TRI MET System, even the Angels Flight funicular railway is back in service in California. As the heydays of the trolley were ending, fortunately there were enough people with the insight to preserve this piece of history and today we have many museums where we can still see and ride some of these fine old cars. As well there are many of the "old" cars being returned to service, not just as tourist attractions but also as functioning transportation. Some of these include the Waterfront Trolley in Seattle, the The F Market Historic Streetcar Line, which is operating a collection of cars from many locations. Also still operating in California in the The San Francisco Cable Car. 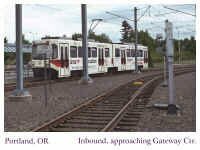 In Tucson, Arizona there's the Old Pueblo Trolley, Texas has the McKinney Avenue Transit Authority, while in Oregon is the Willamette Shore Trolley, operated by the Oregon Electric Railway Historical Society and in New Orleans The Riverfront Streetcar Line is operating. Much has been written about the trolleys of the past and while these notes of mine do nothing more than hit some of the highlights I hope that they may have sparked an interest. While there wasn't more than a passing reference to them here, similar in teresting history can be found dealing with the subway and rapid transit lines, the Interurban lines and more. Some of these lines are operated as part of the areas transit authority while others are operated by historical, no profit, groups. There certainly are more operations working than I've mentioned here and while I've provided a few links here but if you go to Delphi's Railroad Forum's Information Train Station pages you'll find many, many more.